"Real Housewives of Atlanta" star Porsha Williams is a wanted woman ... as in we've learned there's a warrant out for her arrest. 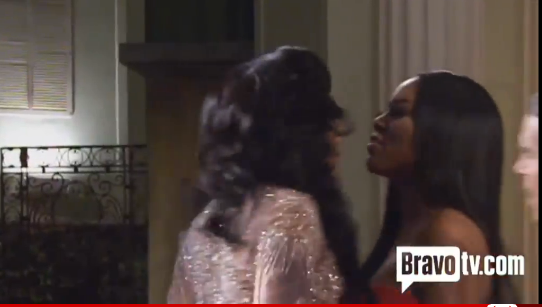 ATL cops are going after Porsha over a fight she had with Kenya Moore on the set of the show. Porsha allegedly attacked Kenya, who filed a police report. The show has the raw footage, and that was enough to charge Porsha with misdemeanor battery -- thus the warrant. Porsha's lawyer, Joe Habachy, tells TMZ she will surrender Thursday. We're also told Porsha plans to go after Kenya ... she wants the D.A. to file felony aggravated assault charges against Moore. RHOA's Season Finale that aired on Sunday night still awaits me on my DVR's playlist. I really been wanting to write about this cast and their b.s. from this latest season. I just haven't had the time to write after each episode. I now plan to do one super write-up on the entire season. Look out for that. Coming soon.